Manchester United were unable to match the intensity shown during Jose Mourinho's extraordinary pre-match press conference, but headers from Romelu Lukaku and Nemanja Matic saw them through to the FA Cup semi-finals at Brighton's expense. Reeling from the criticism that followed Tuesday's shock Champions League last-16 exit at home to Sevilla, the Portuguese went on an impassioned 23-minute defence of his record as he spoke of the Red Devils' "heritage" and challenges on Friday. 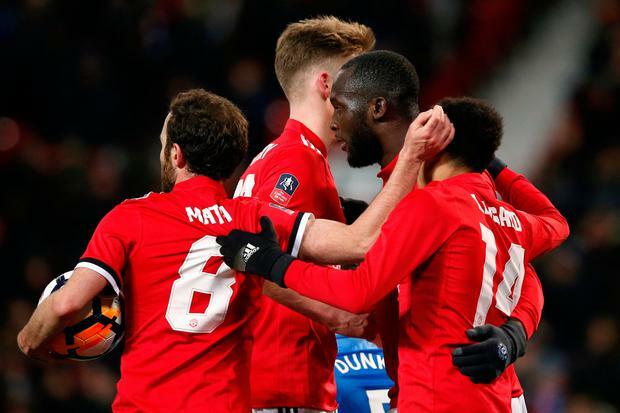 There were to be no such fireworks at Old Trafford against well-drilled Brighton, with Lukaku and Matic - the only two players the United boss highlighted as consistent performers - securing a 2-0 quarter-final win that sends United to Wembley. Progress to the FA Cup semi-finals provides a timely shot in the arm heading into the international break, but Mourinho's side were far from convincing on a bitterly cold evening at Old Trafford. The atmosphere created by the singing section being trialled was far more impressive than the hosts' performance in a drab first half, which briefly flickered into life as Chris Smalling hit a post before Lukaku headed home a 37th-minute opener. United struggled to build on that lead after the break, with back-up goalkeeper Sergio Romero producing several fine saves to deny impressive Brighton before Matic settled things late on. Wembley awaits but Mourinho is sure to have been more impressed by the atmosphere than his side's play. The lack of noise at Old Trafford has been a bugbear for the United boss, so he will have no doubt been pleased by the results of the singing zone in an area normally reserved for away fans. The Red Devils support were having to keep themselves entertained in the first half, with half chances the best their side could muster against a Brighton side creating precious little themselves. Eric Bailly prevented a threatening Solly March cross reaching visiting striker Leonardo Ulloa, before a rare instance of creativity saw Anthony Martial and Juan Mata link up as the latter got away a shot. Albion appeared rightly annoyed to see a corner awarded and their anger almost increased far further, with the ball falling for Smalling to hit a close-range effort off a post. Brighton came close to capitalising on that let-off soon after as Scott McTominay lost Lewis Dunk from a corner, with the Brighton captain forcing Romero in to action. Just as the first half was petering out, the monotony was broken by Lukaku. Matic met a Luke Shaw pass with a first-time cross to the far post, where Lukaku beat Dunk to head past Tim Krul in the Brighton goal. Pascal Gross fizzed an effort wide and Jurgen Locadia saw an attempt comfortably stopped by Romero when play resumed for the second half, with the January signing's next attempt far more dangerous and bound for the top left-hand corner until a fine stop. There were shades of the Sevilla match creeping in and Locadia was looking likely to take the Wissam Ben Yedder role, going close with a near-post header from March's cross in the 67th minute. United were sitting deep and looking lackadaisical as Albion looked to take the match into extra-time, only to get caught by an 83rd minute gut punch as Matic met Ashley Young's free-kick to head his side to Wembley.